Infidèles, coproduced with de Roovers and premièred in May 2018, will be on at the Théâtre de la Bastille in Paris in September. The production is based on the script of the same name by Ingmar Bergman and on his autobiography, The Magic Lantern. 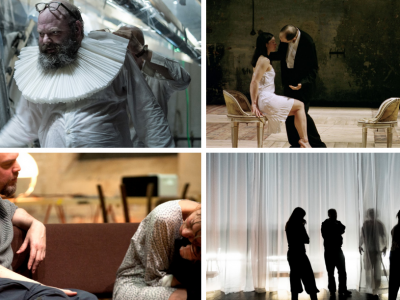 Ruth Becquart, Robby Cleiren, Jolente De Keersmaeker and Frank Vercruyssen explore the interfaces between life and work in the oeuvre of the Swedish director. Infidèles will also be staged at the Ingmar Bergman International Theatre Festival at the Royal Dramatic Theatre (Dramaten) in Stockholm. Après la repetition (After the Rehearsal), also by Bergman, will be staged at the Théâtre de la Bastille in Paris in October and November. Dream and reality merge in this production starring Georgia Scalliet and Frank Vercruyssen about a director and his young leading actress who find themselves left behind in the rehearsal room. In atelier, the ‘poly-production’ by Damiaan De Schrijver (STAN), Peter Van den Eede (de KOE) and Matthias de Koning (Maatschappij Discordia), the actors try to understand what creating theatre is all about. Apart from being staged at Théâtre de la Bastille and La Scène Watteau, atelier will also be part of the city festival Antwerp Baroque 2018 | Rubens Inspires, a tribute to Rubens and his cultural heritage. An important theme of the play – does the artist still have the time and space to explore and reflect? – is the subject of a symposium instigated by ARIA (Antwerp Research Institute for the Arts) in association with the theatre-makers. Quartett was coproduced by STAN and Rosas in 1999. At the request of the Festival d’Automne, it will be performed again at the Centre Pompidou in Paris at the beginning of November. Quartett is based on the eponymous play by the German author Heiner Müller which was inspired by Choderlos de Laclos’ novel Les liaisons dangereuses. Frank Vercruyssen will share the stage with dancer Cynthia Loemij.